When I was nine, I announced to my family that I wanted to play the piano because I was a star in the making and would be just like Debbie Gibson tickling the ivories in her I Get Lost in Your Eyes video. But my mom burst my MTV dreams when she pulled her flute out of storage and explained if I was playing an instrument, this was it. Lame. Wait, can I play “Hanging Tough” on this thing? For two weeks I was totally consumed with my new musical career. By week three, that old flute lost it’s luster and by week four, I got into a scuffle with my older brother and wacked him with the flute. He got a huge egg on his arm, my flute was dented, and my music career was canceled short. It’s OK because I lack any sort of natural music ability. Although when I sing Taylor Swift songs in the car, I totally kill it. 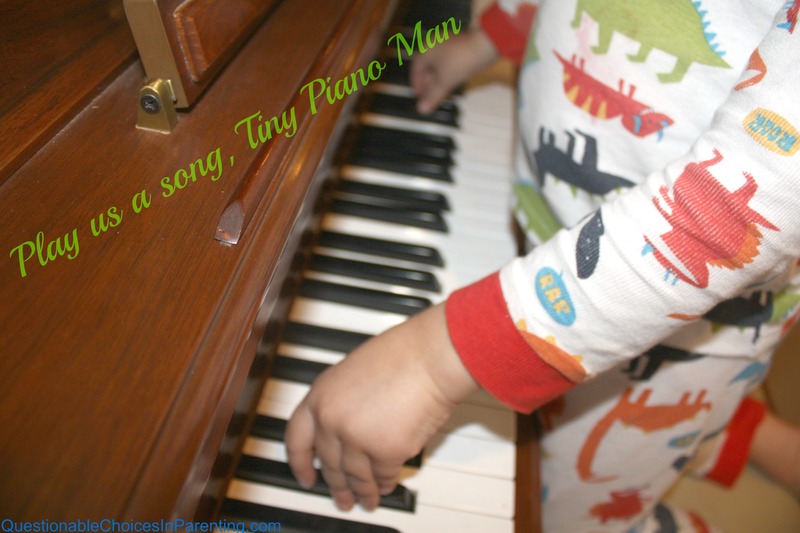 In a moment of deja vu, my son announced, after several episodes of Little Einsteins, he needed to play the piano. 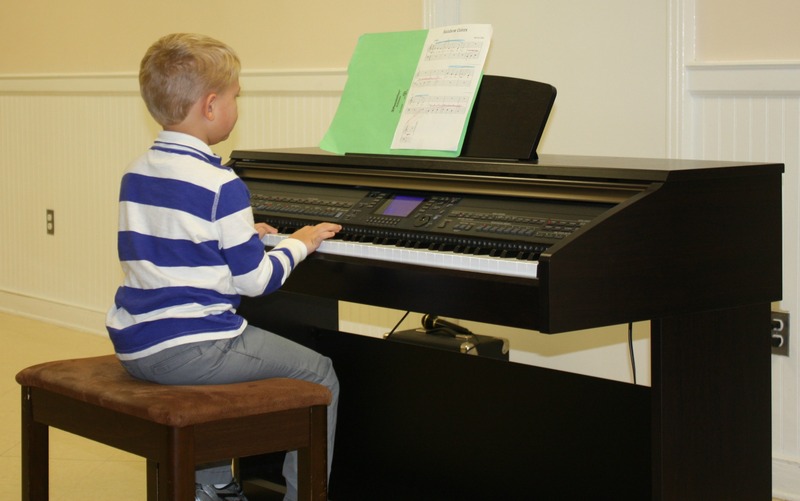 Right away I started reading all sorts of research on the benefits of piano lessons for young children: higher math scores, improved coordination, and even increases in critical thinking abilities, but it would take his first piano recital to show me what I had missed in all the research. After his first lesson, I learned a valuable lesson about what happens when your kid starts playing an instrument: it’s just as much a commitment on the parents part (read: the mom) because you have to practice every day with your kids. My budding piano man never complained when I pulled him away from his toys to practice. However, on the weeks I was a bad piano mom and didn’t make him practice, I would sit anxiously and full of guilt in the waiting room during his lessons because I knew it was my fault he was struggling on a new song. Even on those rough days, he still walked out with a huge smile on his face. 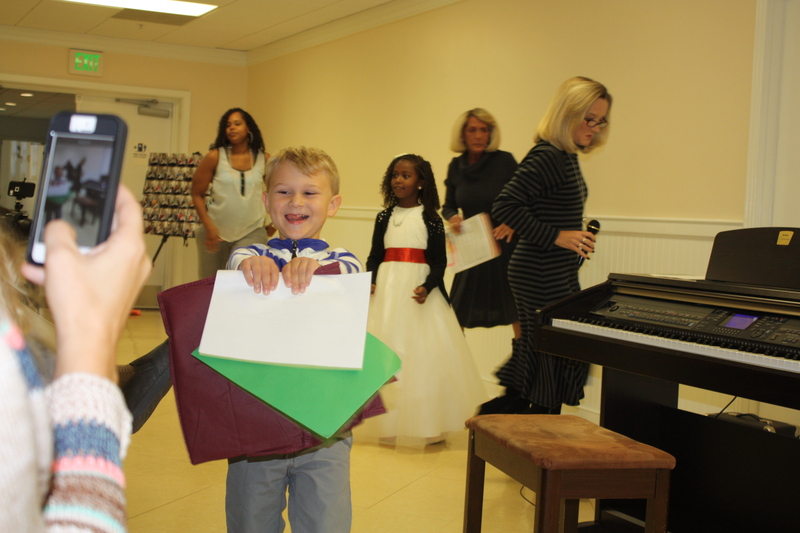 When it came time for his first recital, he picked his own song and within a few weeks had it memorized. But let’s get real here, the kid is five which means on recital day ANYTHING could happen. He could go out there and rock his entire song. He could get up there and refuse to play. He could get up that morning and refuse to wear pants. As his mom, it’s my duty to be a huge ball of nerves for him on any special event. It’s also my job to keep that crazy underwraps and not barf up my breakfast: fail. Is this what I can expect for every performance, game, recital, or speech my kids ever give? Me trying not to barf before their big moment? So he got up to play and I held my breath while he started playing those familiar notes. And then he lost his place and I panicked for him. What probably took a whole ten seconds felt like a sweaty, nauseous eternity to me. I shot his teacher a worried glance hoping she would run over and rescue him, but she didn’t. Immediately I started sweating and looking at him and the piano and his teacher and then at my husband. Should I go up there? Would that help or hurt? OK, I’m counting to ten and then I’m going up there. As if my husband knew my illogical thoughts, he placed his hand in my lap, a gentle restraint. And then this happened. He started playing again, finished his song, and then something I didn’t plan on: pride. So much pride in himself. 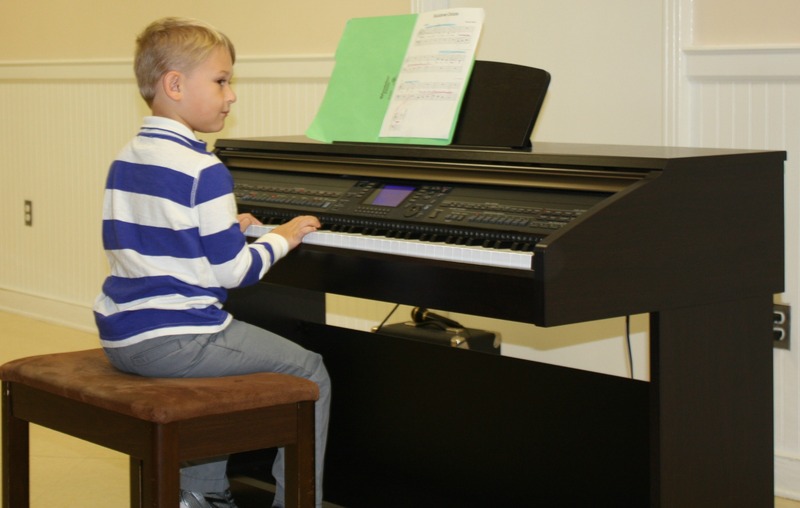 When I thought about his piano lessons, I thought about how this would help him in the future as he made his way through school and standardized tests. I never once thought about the present and what would end up being the most worthwhile outcome of piano. The pride. All the pride in himself. My oldest (now 10) played the drums for 4 years. He took weekly lessons year round and was great at it. Then one day he decided he was done and that was that. About $3000 in lessons later…..
What a great story and he did a great job. I would have wanted to run up and rescue my son too. What a sweet boy and story! 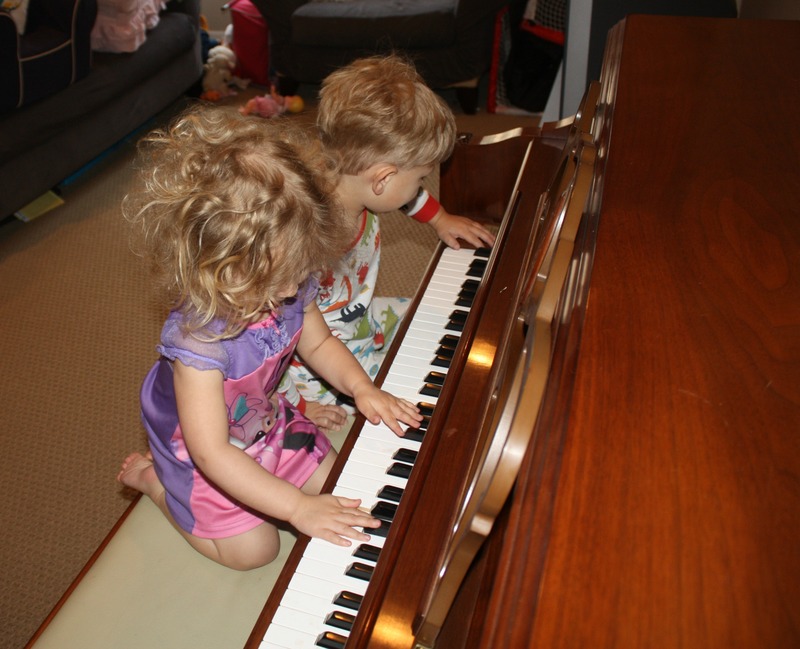 I am hoping to get my daughter into some piano lessons next year – we’ll see how it goes! That is so cool! You know, studies have shown that kids who play music get better grades, so he’s talented AND a smarty pants! The look on his face is priceless! My son is so interested in music right now. I hope it continues. He is so happy! I think music makes us happier in life. Aw, such a good lesson for us mamas. I love the look of pride and accomplishment on his face. Oh, that smile! He’s so proud of himself! That is so cute! My kids love music and want to play instruments. I’m letting them as long as they are interested and want to do it. How great that he didn’t break down and that he trouped on to finish the song! What maturity for a little boy! He looks so proud! I can remember my first piano lessons as well. NOne of my kids had any interest plus we don’t have a piano at our house. I grew up with 3 pianos. Awwww, that is so amazing. He really does look so very proud of his accomplishment! I love this! My daughter started piano last year, but then her teacher went back to teaching music in the elementary schools and we no longer have a teacher. It kills me that she’s not doing it anymore. Must find a teacher STAT. What a little cutie at his recital! That’s beautiful. I always loved the piano, and wish I had kept at it when I was younger but I stopped. My Grandma has a beautiful piano at her house, but we don’t use it as much as we should. I loved this post, and I bet you’re so proud. He looks so happy and proud of himself! I took piano lessons for a while when I was a child. It was a good experience. How beautiful! I’m sitting here with tears in my eyes reading this post. He really does look so proud of himself! … Adorable!! wow he looks so happy and proud. Well done. I think it is great he is taking piano lessons. I loved playing the piano when I was young. I can remember taking piano lessons when i was a kid. I wish i would have stuck with it. He did such a great job.Tell him to keep up the hard work. What a great story! He looks so proud – as well he should be! That is awesome – congrats to your son! I would love for my kids to learn the piano. Love it. My son is learning guitar. I think music is so important for kids to learn. It keeps them from bad habits and gives them an outlet. How awesome. I hope my girls will take to guitar and piano this year. This made me smile. he is so proud! I love that! This has me smiling he looks so proud of himself and so he should be,Congrats you you both :). I can’t remember how many music careers I had haha. At least 5! It’s hard as parents to sit back and let our kids take on the challenge when we see them stuck. Glad he made it through! That is awesome. That is a great smile. Aw he looks so happy and proud! How wonderful . my oldest has been learning violin at school and I can’t help but be so proud too! That is pretty amazing. Congrats to him (and you.) I was a band nerd and played the clarinet in junior high and part of high school. I wish I would learned how to play the piano or violin along the way. This is such great story! Congrats to him! Thanks for sharing this with us. I am sitting here with the biggest grin because – look at his face!!!!!!!!! Yes! That’s awesome. So happy for him. Hi! Love this. I am a professional cellist and my poor mum had to endure all sorts of stress on my behalf. Bless her! I think the piano is the perfect instrument to learn for a million reasons. Wld love to get my 5 year old started but he can’t sit on a chair for longer than 41 seconds. And every time I try and play the piano, my 2 yr old slams the lid shut on my hands. Musical parents but kids ain’t fussed. What a cute boy, and I love your story. I think it is awesome he found something to be passionate about so early on! Oh, how cute! You must be very proud. Piano is the one thing I wish I had stuck with when I was younger. Oh my gosh he is adorable!! Congratulations little guy! !